Iowa CRP Mixes are specifically designed to meet the Iowa Conservation Reserve Program standards. Each state has standards specific to their own state. It is important to purchase seed mixes that satisfy your specific seeding plan. If in doubt on what to purchase or you have questions, don't hesitate to call one of our seed consultants for a free consulation. EXPEDITE YOUR IOWA CRP ORDER!! Click to download the Iowa CRP Quick Order Form. Click the link above, complete the form and submit all required supporting documention by US MAIL. To expedite your order, you may submit the form and a copy of supporting documention via fax or email with Order form with an original signature to follow via US MAIL. Designed to restore your rare and declining habitat areas, this prairie mix has cool season grasses for early spring grazing by birds combined with short and tall warm season grasses that provide excellent nesting material and cover. It also features a beautiful display of wildflowers that are host to a high population of insects. That's important for baby chicks because insects are their only food during a chick's first 4-6 weeks of life.. This is a full-spectrum mix, value priced by Prairie Seed Farms for Iowa CRP acres - at significant savings! A consumer mix with grasses and wildlflower comparable to "Forever Beautiful" would be priced at more than $1000 an acre in most in-home catalogs! This Prairie mix is a blessing for birds, giving them a stiff house of switchgrass for shelter against harsh winter weather while restoring your rare and declining habitat areas. To make "Forever Beautiful PLUS" so bird-friendly, we include a short statue-type switchgrass, in addition to all of the other select species found in Forever Beautiful (#2144), giving you the same cool season grasses for early spring grazing by birds combined with short and tall warm season grasses. If you're looking to stretch your seed dollars a bit, this tall grass mix really goes the distance. It gives you both cool season and warm season grasses combined with wildflowers for beautiful restorative value. While Beautiful Value gives you the same total number of seeds as "Forever Beautiful", they're contained in a reduced number of species for economy (6 wildflowers vs 15). Dollar for dollar, Beautiful Value is a great mix that still provides for a great prairie look with abundant early spring grazing by birds and excellent nesting material and cover. In Beautiful Value Plus, we include a short statue-type switchgrass, in addition to all of the other select species found in Beautiful Value (PSF #CP2-01- IA ). So birds get a stiff house of switchgrass for shelter against harsh winter weather in a mix that still stretches your prairie seed dollars. Still a great mix value, you'll get six terific wildflower species in a bird-friendly mix of cool season grasses for early spring grazing combined with short and tall warm season grasses for bird cover and nesting material. Each species in this mix was intentionally selected in accordance with the unique nesting and growing needs of the Bobwhite quail. Every seed known to be important to the diet of quail is included. Quail Heaven has an astounding array of grasses - short and tall, cool and warm season - to provide all the nesting material and the ultimate habitat cover that quail need to thrive. 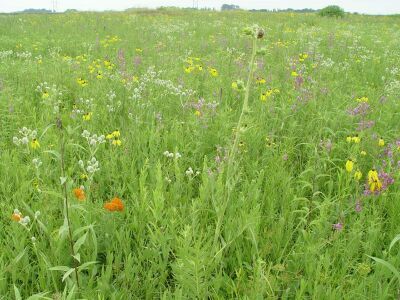 Ten different wildflower species make for a gorgeous prairie display that supports all the insects that quail chicks need for food at every stage of their growth. This IS heaven for quail. Try this heavy dose of prairie grasses when you're not quite ready to splurge with wildflowers (forbs). Meets Iowa NRCS requirements for grass only and it's an excellent choice if some 2,4-D spraying needs to be done later to eliminate some nasty perennial weeds. Adding fifty pounds nitrogen per acre after its established makes a thick under and upper story to filter out dust and noise along a busy road while adding a pleasing asthetic look. It's deer friendly too, because deer love to hide and sleep in thick stands of prairie grasses. (include? ): For increased winter cover Switchgrass can be purchased separately from the individual species price list and added to this mix.